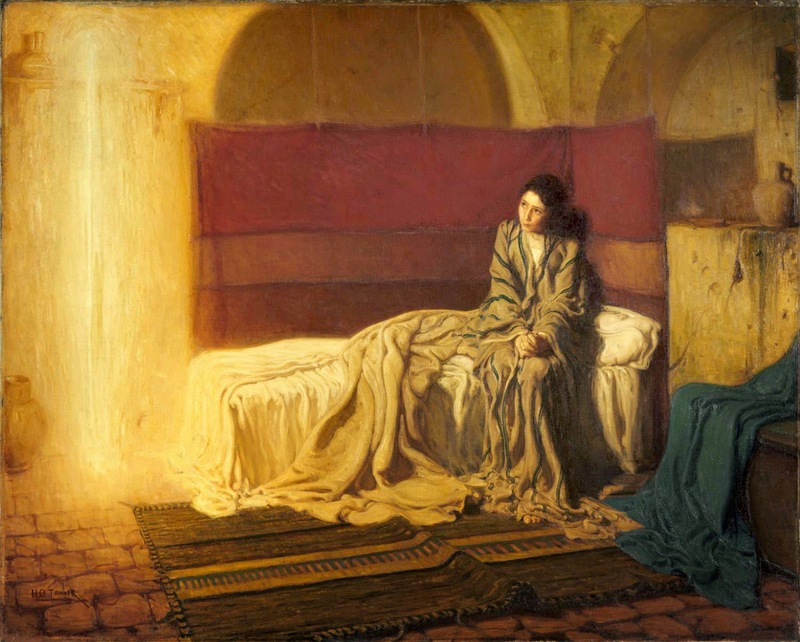 Henry Ossawa Tanner’s The Annunciation (1898) is a study of illumination and intimacy. The angel Gabriel appears as a shaft of amber light, brightening the room where a young Mary humbly sits. We take in what others have already noticed. Mary appears all too young, free of any kind of religious adornment. The light casts a noonish shadow, shortened as if at vernal equinox. Hanging carmine and burgundy tapestry protecting against pockmarked walls; unkempt floor rug barely covering the cobbled floor; lapis lazuli gown issuing over a roughly-hewn wooden chest; clay urns; an oil lamp whose flickering barely registers against the glowing visitant: these are all known, and yet what is truly striking about the painting is the way it captures a moment of intense intimacy. Mary is learning that she will give birth to the Son of God, and Tanner’s choice of warm, gilded hues seems at odds with the actual moment, an annunciation as expansive and radiating as it is hushed and secretive. Mary does not avert her gaze. She stares at a point above the glimmering, somewhere beyond the picture frame. Her eyes remain intelligent and searching, committed to an act of seeing familiar to us across various registers. All are premised on knowing more things, more people, more insights. As we “look down” on the offensive or “look askance” at a problem, we also “look up” words and “look up to” people: expressions that associate seeing with a specific vantage point. Or, the very objects and images that capture our sights reveal something different or surprising once we orient ourselves at various angles. William Eggleston, Untitled n.d. from Los Alamos, 1965-68 and 1972-74 (published 2003.) 1965-68 and 1972-74. Dye transfer print, 12 x 17 ¾ inches (30.5 x 45.1 cm.) 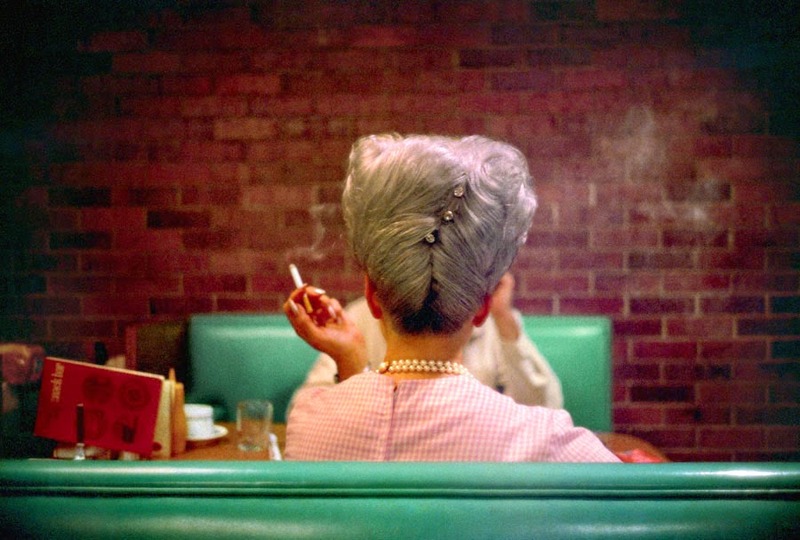 Private collection © Eggleston Artistic Trust, courtesy of Cheim & Read, New York. This is one reason why I find William Eggleston’s work so arresting. His dye-transfer color photographs of supermarket aisles, car lots, hairdressing salons, and gas stations in the American South are mundane and meticulous. The subjects may be humdrum; a considered look reveals that they are everything but. For example, in Untitled (n.d.), a woman talks to a friend at a diner. At least, this is what we think is happening. Taken at eye-level, the photograph frames the back of the woman’s head, a greying bulb of symmetrical whorls restrained by clear, flower-topped combs. Her pink gingham dress reveals even more than what we think. The clasp on the necklace was once aligned on the center of the back of her neck, now only slightly off from the zipper top stops. This accentuates the difference in the angles between neckline and shoulder: the woman is shifting, perhaps in mid-sentence, or even covering her mouth as she is laughing at her companion’s joke. The woman is seated along the same axis her companion, each holds their cigarette with their left hand, a mirroring suggesting the two are familiar, comfortable. In this image, there is conversation without content, and yet the setting, dimly lit with seafoam green booths and dark, ruddy brickwork, reveals an intimate communiqué inside a Tennessee diner, on any night, at any time. Should we elevate ever so slightly and train our eyes towards the ceiling, we may see something like Eggleston’s Greenwood, Mississippi (1973). Featured on the album cover of Big Star’s Radio City, the blood red ceiling in the photograph is remarkable because it is, for lack of a better term, so red. The photograph signaled Eggleston’s true arrival into the art-photographic establishment, announcing a new artistic potential for high-saturated, dye transfer color photography. Like his other works, this photographs captures many details, from the unfinished mouldings to the posters showing sexual positions. 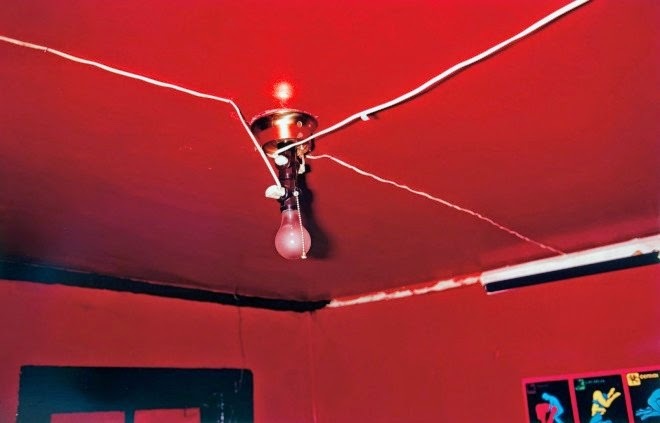 Eggleston took this photograph supposedly inside a brothel, and though there is much to parse here in that regard, I am drawn to the light bulb. 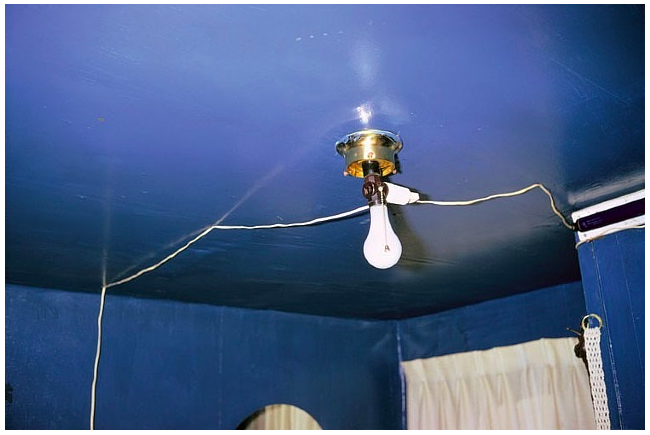 This is not necessarily because it appears as a kind of power node or nerve center, an object that conducts electricity and life into the room with cords and wires, but rather the opposite, for the bulb appears dark, and the only light in the room is the one coming from Eggleston’s camera. In fact, we are so close to the painted ceiling that it reflects the camera flash. A similar flashing appears in Untitled (Blue Ceiling), and yet here, the effect is wholly different. Other than the obvious difference in color—the blue paint does not appear as garish as the red ceiling in Greenwood, Mississippi—the light bulb in the blue room also radiates cords, wires, and lanyards, and yet it is lit, adding a bit of ambiance to the camera flash even if it still creates the harshest of shadows. 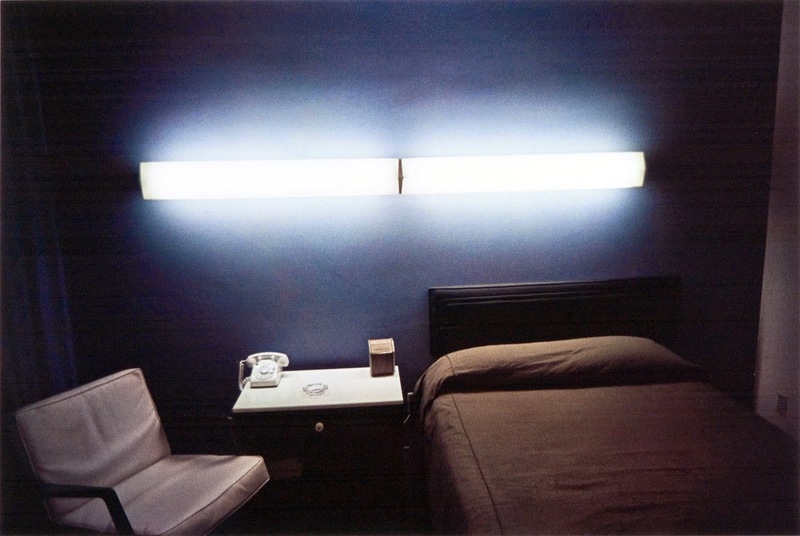 Were we to tilt our heads downwards, we confront Eggleston’s Untitled (n.d.), a photograph of a small motel room whose only source of light comes from the fluorescent fixtures mounted above the bed. We are also drawn into the light, a soothing glow that gives this room an intimate, tranquil aspect. In these three photographs, light emanates and suffocates. Through these attenuated vantage points in cramped spaces, the light announces something previously unknown. William Eggleston, Untitled, n.d. from Los Alamos, 1965-68 and 1972-74 (published in 2003.) 1965-68 and 1972-74. Dye transfer print, 12 x 17 ¾ inches (30.5 x 45.1 cm. ), Private collection © Eggleston Artistic Trust, courtesy of Cheim & Read, New York. Following the light, I note that the illumination in this last image of Eggleston’s recalls the glowing, bulb-like head in René Magritte’s The Pleasure Principle (Portrait of Edward James) (1937). And my goal is not to use this image for invoking something like “enlightenment,” a term with its own historical and intellectual baggages. 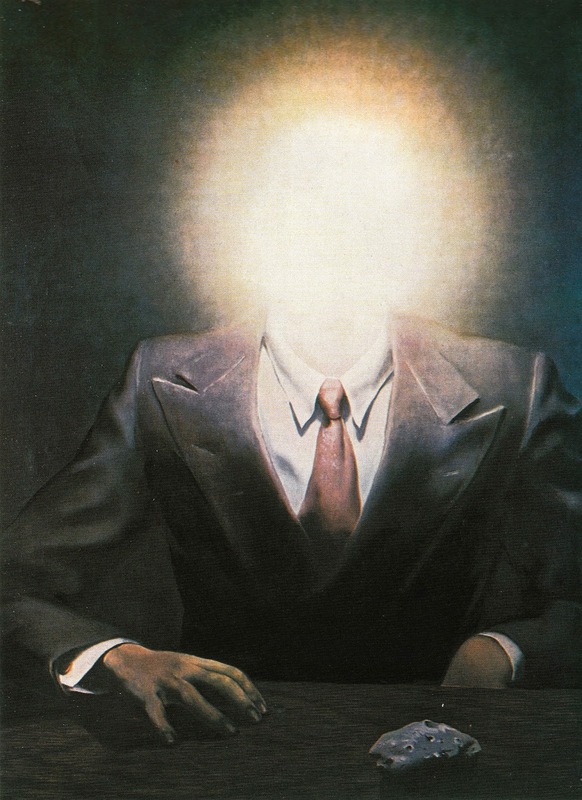 Rather, I use Magritte’s curious portrait of Edward James, with its head exploding into a burst of radiating light, to remind (at least) myself, that ideas propagate outward. Like light, they are reflected back onto ourselves or refracted in other directions. I would like to think that this propagating light is a metaphor for writing, a practice that has been all too absent from my life of late, and which I embrace again.